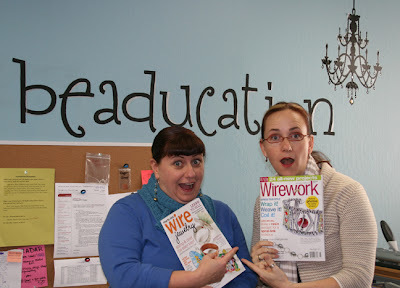 When our fearless leader, Lisa Niven Kelly, is featured on the cover of Wirework Magazine, we here at Beaducation are all thrilled and excited. 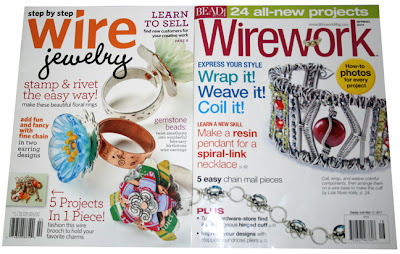 This month, is an especially exciting one here at Beaducation.com because not only is Lisa’s wire cuff gracing Wirework’s cover, but our very own Director of Education, Kate Richbourg’s Riveted Flower Rings are on the cover of Step by Step Wire Jewelry Magazine! As you can see, Lisa’s cuff is made up of coiling, wrapping and weaving wire to make intricate colorful components that are then wrapped onto a wire base to make this fabulous cuff. 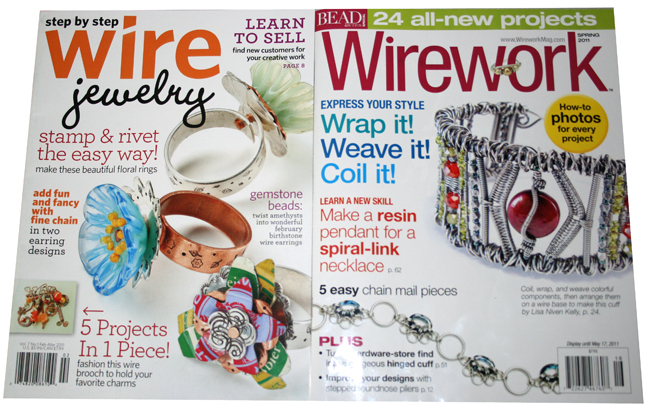 Pick up your Spring 2011 copy of Wirework today and follow her instructions to become a wire wrapping warrior, with this Amazonian cuff as proof you completed a beautiful project! Kate’s Riveted Flower Rings will take your breath away. Kate uses small and large flower blanks, flat wire, glass flowers and even recycled bottle caps to create these whimsical little conversation pieces. Pick up your February/March 2011 copy of Step by Step Wire Jewelry and see how she cuts, hammers, stamps, daps and rivets her way to making a masterpiece. Here at Beaducation, we as fellow staff members, are just getting used to rubbing shoulders with famous cover girls. Move over Heidi Klum and Tyra Banks, there are two new fashionistas in town: Lisa Niven Kelly and Kate Richbourg, and we think they are pretty amazing. You GO ladies!!! Good for you! Gretchen and I both bought copies this weekend! The projects look really fun! Great job girls! Just love love love your work, plus you guys are the BEST. Thanks for all your help.